Spanish, Culture and Adventure . . . This exciting 2-week program combines Spanish classes and cultural excursions in either of two distinct cities - Quito or Cuenca with a week in the spectacular Galapagos Islands on an 8-day land-based tour. 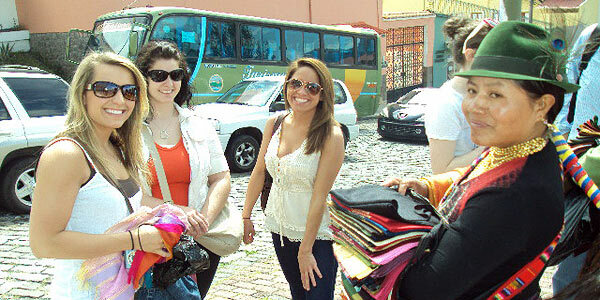 Quito Cultural or Cuenca Cultural Spanish Program: 20 hours of Spanish classes and excursions to places of historic and cultural interest around Quito or Cuenca. Galapagos Islands Tour: An 8-day land-based tour of the Galapagos Islands, taking in 4 disctinct islands with a series of whole-day and half-day excursions, based on the islands of Santa Cruz and Isabela. In Quito you will stay with a local host family for the week while you study Spanish. This offers the perfect immersion in Spanish as you interact with your friendly and sociable hosts in the morning and evenings. The day will be taken up with regular Spanish classes and visits to places of interest around the city, combining Spanish tuition with more touristic activities. As an alternative for accommodation we can offer hostel or hotel options. The second week of your visit to Ecuador is an 8-day land-based tour of the incredible Galapagos archipelago, visiting several distinct islands and exploring both above and below the waterline. This once-in-a-lifetime experience will be the highlight, of your stay, an educational adventure providing a wealth of unforgettable memories. "I had a busy busy two weeks in Ecuador on this program. My classes in Quito were great, very productive, especially combined with the afternoon excursions. I did a quick trip to Otavalo on Saturday before flying off to Galapagos on Sunday. That was a truly amazing week - exhausted every night from all the activity. So all in all it was fantastic!" If you have a shorter period of time available we can offer an alternative itinerary, adding in activities that are of particular interest and adapting to your specific needs and preferences. True Ecuador Travel has put together a number of exciting combination packages that offer culture, adventure, learning and much more. Using our extensive network of contacts throughout Ecuador and the Galapagos Islands, our programs offer exceptional quality, diversity, and value for money.